If you haven't discovered the fashion label J.Crew yet, then you're in for a fashion treat. The New York-based label was founded in 1983, but has become hot sartorial property in recent years thanks to the brand's creative director as of 2007, Jenna Lyons. Lyons is the living and breathing embodiment of the brand, her preppy electic look is reflected throughout all the J.Crew collections. 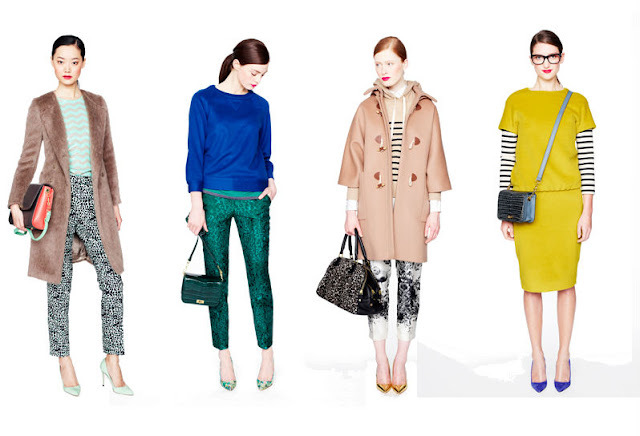 So what's the J.Crew signature look all about? Well expect the unexpected with this fashion brand, colour combinations are delightfully off-the-wall and styling is kooky and unique; a casual hoody pared with sleek courts and printed cropped pants shouldn't work but 100% does. Prices are not the upper end of the designer scale either, with cotton tees starting at £30. Currently you can only shop the collection online at Net-a-porter, The Outnet and J.Crew.com, but rumour has it Lyons has been spotted scouting London for locations for a UK flagship. Watch this sartorial space! great collection, unfortunately we don't have J.Crew here in Hungary and in Poland where I come from too. Happy Easter!!! Oooh I love J Crew, great picks!! I featured your blog on mine today! J. Crew has always been a favourite of mine! Found your blog at Style Servings and loving it !! I'm your new follower! they have amazing style!! wait until I can get a bigger income and Ill be there every month haah! Omg, I dind't know. But I'm loving!